Feel stressed and overwhelmed? Cannot sleep and/or have no energy? Crave sugar, salt, caffeine, and/or carbohydrates? Have mood swings and are irritable Notice unexplainable weight gain? 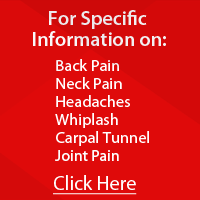 Experience chronic pain? You do not have to keep on suffering! You can choose to feel better and start living! It all starts with Nutritional Counseling at Grandview Chiropractic Center Center! With our excessive consumption of fast food, junk food, soda, coffee, and alcoholic beverages, our bodies have been robbed of their nutrients! Then add in all of the emotional and physical stresses as well as the environmental pollution we subject ourselves to, it is no wonder our health suffers! Unfortunately, the human body was not designed to run on "empty" foods, so it begins a gradual, unnoticeable decline. The longer the body is deprived of nutrition, the steeper the decline and the more symptoms develop. Before we know it, our body has lost control and specific conditions, like diabetes or fibromyalgia, are your resulting diagnosis. Proper nutrition with the appropriate usage of whole food supplements is a way to regain control. Understanding nutrition is scary, complex, and confusing, but we eliminate the stress and guesswork for you! Having the ability to discuss your nutritional needs and goals with Dr. Barry Radandt at Grandview Chiropractic Center Center makes for an easy, manageable transition from poor health to vibrant life! Your first step is to call and set up an appointment for a brief mini-consultation with Dr. Barry Radandt. During this 15-minute consultation, you meet the doctor and discuss your health concerns. Dr. Radandt will assess your condition and let you know if it is something he can work with nutritionally. At this time, a Systems Survey Form is given to you to take home and complete. Once you have completed your Systems Survey Form, you need to either drop it off at our clinic or mail it back to us with the required payment. At this point, you can now set up an appointment for your nutritional counseling session, allowing a few days for Dr. Radandt to analyze your results and create a tailored support plan for you. He carefully considers any medications you take, any allergies you have, and your overall lifestyle. At your nutritional counseling session, plan about 35-40 minutes for Dr. Radandt to go over your Systems Survey Form results, explain his support plan for you, offer reasonable suggestions, and answer any questions you may have. He will finish the session by showing you which Standard Process Whole Food Supplements are on your support plan. It is your choice if you would like to purchase any supplements, but either way, your results and support plan are yours to keep. At Grandview Chiropractic Center, we proudly offer Standard Process Whole Food Supplements. Standard Process was established in 1929 by Dr. Royal Lee, a pioneer in nutrition and its relationship to health. Standard Process is locally owned and operated in Palmyra, WI. Their organically-grown crops and state-of-the-art manufacturing facility combine to make products of the highest nutritional quality. With their commitment to research and development as well as their dedication to educating consumers, Standard Process continues to be a leader in nutrition and whole food supplements. A certified healthcare professional evaluates your health and nutritional needs, and then creates a tailored support plan for you. They will help you set achievable goals, provide you with the specific nutrients your body needs, and answer any questions or concerns you may have. Our professional expertise and knowledge will save you time, money, and frustration spent on the newest fad or supplement. What is the cost of nutritional counseling? The initial Systems Survey Form assessment and consultation is $99 (established patients SAVE $20). Systems Survey Form re-assessments are $59. What is the cost of your health worth to you? How long will it take before I start to feel better or see improvement? Your health gradually deteriorated over time, so depending upon factors, such as how healthy and how motivated you are, will determine how quickly your body will respond. Initially you may feel sluggish as your body begins to heal. Later you will feel your energy increase as your health improves. Finally, once your body is fully capable of absorbing the nutrients, you will feel a gratifying return to the health you had thought lost! How is nutrition linked to chiropractic? As the saying goes, "you are what you eat" is very appropriate when linking chiropractic and nutrition. Poor nutrition contributes to physical problems, such as headaches and back pains, while reducing your body's ability to heal itself. Eating greasy french fries or drinking a soda forces your body to search for other sources of quality nutrients. If you do not supply that source, your body ceases to function and illness results. Why am I not getting proper nutrition from my diet? Foods today are packaged for convenience and longer shelf life. Unfortunately, while doing this, the essential nutrients are severely diminished and multiple preservatives are added. Also, many chemicals are used to grow the fruits and vegetables, and the meat and poultry are injected with hormones. So it becomes very difficult to eat "healthy" at your local grocery store! What is the difference between synthetic vitamins and whole food supplements? Synthetic vitamins are made with chemicals in a laboratory. Whole food supplements are made from food grown in healthy soil conditions to contain all of the essential vitamins and nutrients found in nature that we were intended to eat. The supplement is then packaged in a convenient tablet or capsule form. Initially, the human body cannot differentiate between synthetic and whole food, but over time it realizes that synthetics offer a very poor substitute for natural vitamin sources. Are there any side effects with taking whole food supplements? Typically there are no harmful side effects since whole food supplements are food based (no chemicals are added). That being said, minimal prescription drug interactions could possibly occur, so it is ABSOLUTELY necessary to share with your healthcare professional any medications and vitamins you are taking. Will I be expected to cook and eat all-natural, organic food? No. We will give advice on the best choices of food available for you to gradually incorporate into your present diet. These choices will work with your current lifestyle, while still providing the highest health benefits. We understand that it is not always practical to cook and prepare healthy choices. For that reason, we recommend filling in the nutritional gap with the convenience of whole food supplements.